Spider veins (classified as a subform of varicosis in medicine) are thin, but clearly visible veins in the outmost layer of the skin. They develop primarily in the legs. Spider veins are distended superficial veins in the legs that form a network under the skin. Although the individual spider veins are only a few millimetres long, they criss-cross parts of the leg and thigh like a spider's web. This is also how the term originated. Small spider veins are bright red. As they grow larger, they take on a blue hue. The vein walls become flaccid with age. The blood is no longer transported quickly enough and pools in the legs. Experts estimate that around half the population is affected by spider veins. Women suffer from these more often than men. The cause of weak vessel walls and spider veins is lax connective tissue – this can be inherited. What happens if spider veins are left untreated? If the spider veins remain superficial, the circulation to the legs is still guaranteed. In most cases, spider veins do not cause any symptoms, so they do not need to be treated. Occasionally the web of spider veins expands over large areas of skin, which is then painful. However, spider veins can also be a visible sign of a disorder of the deeper, larger veins. Spider veins that develop below the inner ankle bone are a special form. 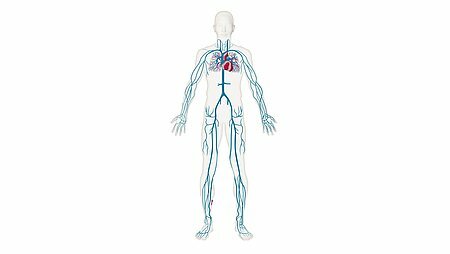 As a rule, they are the first sign of chronic venous stasis and must be treated. This is why people should have their legs examined by a doctor to rule out early venous disease.